11th lunar month of 1719: disciple of Mizuki Somenosuke II, he received the name of Mizuki Somematsu and started his career as an iroko. He performed in the kaomise drama "Chiyo no Ume Naniwa Kagami", which was produced in Kyôto by Sakakiyama Shirojûrô. 11th lunar month of 1726: he became wakaonnagata and performed at Hayagumo Chôdayû's theater in the kaomise drama "Shinzô Kishi no Himematsu". 1st lunar month of 1727: Shichisaburô's rank in the Kyôto hyôbanki, wakaonnagata section, was jô (superior) [visual]. 1730: tour in Ise with Arashi Shichigorô I and Sakurayama Shôzaemon II. 11th lunar month of 1734: he became tachiyaku, took the name of Somematsu Shichisaburô I and played in Kyôto at Kameya Kumenojô's theater the role of the hairdresser Chôsuke in the kaomise drama "Oyayuzuri Kogane no Katokugura", which was produced by Sakakiyama Shirotarô I. 1st lunar month of 1735: Shichisaburô's rank in the Kyôto hyôbanki, tachiyaku section, was jô-(shiro)jô (superior - (white) superior) [visual]. 11th lunar month of 1735: Shichisaburô played the role of Yukienojô in the kaomise drama "Shin-yakata Banzei no Ishizue", which was produced in Kyôto by Arashi Koroku I. 1st lunar month of 1736: Shichisaburô's rank in the Kyôto hyôbanki, tachiyaku section, was jô-jô-(shiro)hankichi (superior - superior - (white) half excellent) [visual]. 11th lunar month of 1737: Shichisaburô played at Ebisuya Kichirôbê's theater the role of Kamonnosuke in the kaomise drama "Hachiman Tarô Denju no Tsuzumi", which celebrated the shûmei of Yoshizawa Sakinosuke II. 3rd lunar month of 1738: Shichisaburô's rank in the Kyôto hyôbanki, tachiyaku section, was jô-jô-(shiro)kichi (superior - superior - (white) excellent) [visual]. 1st lunar month of 1738: Shichisaburô played in the same theater the role of the wakadono Katsujirô in the new year ni-no-kawari drama "Keisei Daihi no Taki". 11th lunar month of 1738: Shichisaburô played at Hoteiya Umenojô's theater the role of Suminoe Tanomo in the kaomise drama "Neko no Ko no Koneko no Ko". 11th lunar month of 1739: Shichisaburô performed in the kaomise drama "Oiwai Nô Nishiki no Manmaku", which was produced by Nakamura Kumetarô I at Nakamura Wakadayû's theater. He also had to replace Arashi San'emon III, who fell ill.
11th lunar month of 1740: Shichisaburô performed in Kyôto at Miyako Mandayû's theater in the kaomise drama "Asuka Miyako Jindai no Maki", which was produced by Nakamura Kumetarô I. 1st lunar month of 1741: Shichisaburô's rank in the Kyôto hyôbanki, tachiyaku section, was jô-jô-(hanshiro)kichi (superior - superior - almost excellent) [visual]. He shared the same rank with Fujioka Daikichi, Haruyama Genshichi II and Tamiya Jûzaburô I. Shichisaburô played in the same theater the role of the wakadono Nuinosuke in the new year ni-no-kawari drama "Keisei Ôigawa". 2nd lunar month of 1741: Shichisaburô played in the same theater the role of Soga Jûrô Sukenari in the san-no-kawari drama "Date Kosode Susono no Sakura". This drama was sogamono, a rare feature in Kamigata. The roles of Kudô Saemon Suketsune, Soga Gorô Tokimune, the courtesan Ôiso no Tora (Jûrô's lover) and the courtesan Kewaizaka no Shôshô (Gorô's lover) were played by Fujikawa Hanzaburô II, Ogino Izaburô I, Sakata Ichitarô and Nakamura Kiyosaburô I. 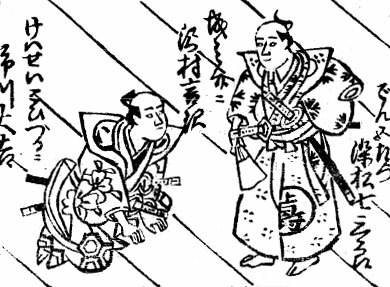 11th lunar month of 1741: Shichisaburô played in Kyôto the role of Negi Tomonoshin in the kaomise drama "Imayô Shinoda Zuma", which was produced at Miyako Mandayû's theater by Nakamura Kumetarô I. 1st lunar month of 1742: Shichisaburô's rank in the Kyôto hyôbanki, tachiyaku section, was back to jô-jô-(shiro)kichi (superior - superior - (white) excellent) [visual]. 7th lunar month of 1742: Shichisaburô played in the same theater the roles of Ono no Harukaze and the servant Mosuke in the drama "Narukami Fudô Kitayama Zakura" ; the roles of Narukami, Kumedera Danjô and Fudô Myôô were played by Ogino Izaburô I. 11th lunar month of 1742: Shichisaburô played at at Ebisuya Kichirôbê's theater the role of the yakko Arisuke in the kaomise drama "Yamato-fumi Kaoyo Hinagata", which was produced by Sakata Ichitarô. 11th lunar month of 1743: Shichisaburô played at Hoteiya Umenojô's theater the role of Hôjô Tokimune in the kaomise drama "Yomeiri Ôshimadai", which was produced by Nakamura Kumetarô I and celebrated the shûmei of Sanjô Mankatsu. 12th lunar month of 1743: Shichisaburô played in the same theater the roles of Hata no Kanjirô Toyokatsu and Ôtomobô in the drama "Kume no Sennin Yoshino Zakura". 11th lunar month of 1744: Shichisaburô played at Hoteiya Umenojô's theater the role of Okazaki Yasaburô in the kaomise drama "Tanba Yosaku Kameyama Kayoi", which was produced by Nakamura Kumetarô I. 11th lunar month of 1745: Shichisaburô played at Hoteiya Umenojô's theater the role of Kinugasa Yukienosuke in the kaomise drama "Toragoyomi Hoteibukuro", which was produced by Nakamura Kumetarô I. 1st lunar month of 1746: Shichisaburô played in the same theater the role of Momonoi Okajirô in the new year ni-no-kawari drama "Keisei Kinugasayama". 11th lunar month of 1746: Shichisaburô became zamoto and produced in Kyôto the kaomise drama "Fukki no Ôshimadai" , in which he played the role of the wakadono Nagahama Shiganosuke; his stage partners were Nakamura Jûzô I, Bandô Sukesaburô I, Takenaka Heikichi, Sakakiyama Shirotarô I, Fujioka Daikichi and Imamura Shichisaburô II. 6th lunar month of 1747: Shichisaburô produced in the same theater the drama "Kiichi Hôgen Sanryaku no Maki", in which he played the role of Yoichi. 11th lunar month of 1747: Shichisaburô performed in Kyôto at the Minamigawa no Shibai in the kaomise program "Meiken Kogane Zukuri", which was produced by Nakamura Kumetarô I. 1st lunar month of 1748: Shichisaburô's rank in the Kyôto hyôbanki, tachiyaku section, was jô-jô-(hanshiro)kichi (superior - superior - almost excellent) [visual]. 11th lunar month of 1748: Shichisaburô became zamoto and produced at Miyako Handayû's theater the kaomise drama "Mitsu Uroko Asahi no Ume", in which he played the role of Nitta Yoshisuke; his stage partners were Fujioka Daikichi, Ichikawa Danzô III, Iwata Somematsu I, Yamanaka Heijûrô I, Mihogi Shichitarô and Ôtani Hirohachi I. 11th lunar month of 1749: Shichisaburô produced at Miyako Handayû's theater the kaomise drama "Imosegura Kogane no Ishizue", in which he played the role of the wakadono Yamatonosuke; his stage partners were Ichikawa Danzô III, Fujikawa Heikurô, Asao Motogorô I, Anegawa Daikichi I, Arashi Tôjûrô, Yamatoya Jinbê IV, Ichikawa Kanjûrô, Ôtani Hirohachi I, Arashi San'emon IV, Toyomatsu Kamon and Nakamura Yaehachi. 11th lunar month of 1750: Shichisaburô played in Kyôto at Ebisuya Kichirôbê's theater the role of Murakoshi Dengozaemon in Fujikawa Sakoku's kaomise drama "Taira no Miyako Onna Ezôshi", which was produced by Sakakiyama Shirotarô II [picture]. 1st lunar month of 1751: Shichisaburô played in the same theater the roles of the wakadono Yamatonosuke and the Shoshadera bonze Gyôshun in Fujikawa Sakoku's ni-no-kawari drama "Keisei Kane-ga-Fuchi" [picture]. 11th lunar month of 1751: Shichisaburô played in Kyôto at Hoteiya Umenojô's theater the role of Kiso Yoshinaka in the kaomise drama "Kaeribana Shinohara Gunki". 1st lunar month of 1752: Shichisaburô's rank in the Kyôto hyôbanki, tachiyaku section, was jô-jô-kichi (superior - superior - excellent) [visual]. He shared the same rank with Nakayama Shinjûrô, Sakakiyama Koshirô II, Fujioka Daikichi, Sakurayama Shirosaburô II and Yamashita Matatarô I. 4th lunar month of 1752: Shichisaburô played in the same theater the roles of Hayano Kanpei and Ishidô Umanojô in the drama "Kanadehon Chûshingura". 11th lunar month of 1752: Shichisaburô played at Hoteiya Umenojô's theater (Kitagawa no Shibai) the role of Hiraga no Saburô in the kaomise drama "Tenka Taiheiki", which was produced by Arashi San'emon IV and celebrated the shûmei of Sawamura Otoemon II. 11th lunar month of 1753: Shichisaburô performed at Hoteiya Umenojô's theater in the kaomise drama "Futaba no Nishiki Midori no Onikage"; his stage partners were Fujioka Daikichi, Imamura Shichisaburô II, Sawamura Kunitarô I, Sakata Tôjûrô III, Arashi Tominosuke I, Onoe Montarô and Bandô Sukesaburô I. 11th lunar month of 1754: Shichisaburô played at Hoteiya Umenojô's theater in Kyôto the roles of Minamoto no Yoritomo and Shinobu no Rokurô in the kaomise drama "Fûkigusa Aioi Genji", which was produced by Shichisaburô's son Somematsu Matsujirô. This drama was in fact the first Kabuki adaptation of the puppet drama "Yoshitsune Koshigoejô" [more details]. 11th lunar month of 1755: Shichisaburô played at the Kitagawa no Shibai the role of Narutaki Kisanta (in reality Kaneuri Kichiji) in the kaomise drama "Onna Monji Heike Monogatari", which was produced by Shichisaburô's son Somematsu Matsujirô. 2nd lunar month of 1756: Shichisaburô played in the same theater the role of Imagawa Nakaaki in the ni-no-kawari drama "Keisei Sato no Kawazu". 6th lunar month of 1756: Shichisaburô played in the same theater the role of Onnanosuke in the "Imorizake" act of the drama "Karukaya Dôshin Tsukushi no Iezuto"; the roles of Yûshide and Tatara Shindôzaemon were played by Nakamura Kumetarô I and Imamura Shichisaburô II. 11th lunar month of 1756: Shichisaburô played at the Kitagawa no Shibai the role of Kadowaki Shinpei in the kaomise drama "Ukematsuri Hôrai Yakata", which was produced by Shichisaburô's son Somematsu Matsujirô. 1st lunar month of 1757: Shichisaburô played in the same theater the role of Hosokawa Yorikatsu in the ni-no-kawari drama "Keisei Tsukimatsuyama". 3rd lunar month of 1757: Shichisaburô played in the same theater the role of Minbu in the drama "Narukami Fudô Kitayama Zakura"; his stage partners were Ichikawa Danzô III (Narukami, the deity Fudô Myôô and Kumedera Danjô), Nakamura Kumetarô I (Princess Taema) and Yoshizawa Sakinosuke II (Kisakata Gozen). 10th lunar month of 1757: Shichisaburô played in the same theater the role of the Iseya tedai Kinshichi in the drama "Kameyama Soga Gojûnenki". He fell ill afterwards and could not take part any kaomise at the end of the year. 11th lunar month of 1758: Shichisaburô was back on stage; he performed at the Minamigawa no Shibai in the kaomise drama "Homare Musha Senri no Kachidoki", which was produced by Sawamura Kunitarô I and Somematsu Matsujirô. 1st lunar month of 1759: Shichisaburô's rank in the Kyôto hyôbanki, tachiyaku section, was jô-jô-kichi (superior - superior - excellent) [visual]. He was kanjiku for tachiyaku actors. Shichisaburô performed in the same theater in the new year ni-no-kawari drama "Keisei Kachôzan". 7th lunar month of 1759: Shichisaburô played in the same theater the roles of Sakuma Shingo and Isogami Tonerinosuke in the dramas "Shimabara Okuni Kabuki" and "Kurikararyû Renbo no Fuchi". He fell ill around that time and stopped acting. 10th day of the 9th lunar month of 1762 : Shichisaburô died in Kyôto. Somematsu Shichisaburô I was a Kyôto tachiyaku actor, who was active in the Imperial City from the end of the 1710s to the end of the 1750s. He never performed in Ôsaka, Nagoya or Edo. He was outstanding in wagoto and wakadono roles were his forte. He was zamoto for 3 seasons (1747, 1749 and 1750) and kanjiku twice (1750 and 1757). The 10th day of the 9th lunar month of the 12th year of the Hôreki era was the 26th of October 1762 in the western calendar. "Narukami Fudô Kitayama Zakura" was premiered in the 1st lunar month of 1742 in Ôsaka at the Ônishi no Shibai [casting]. It was such a huge success that it was quickly staged in Kyôto. The three leading roles were also played by an actor trained in Edo. The two main sakusha were Nakamura Gohachi and Namiki Eisuke I.